This entry was posted in iPhoneography, Pets, Photo Challenge, Photography and tagged Animals, Cats, Feline Friday, Freckles, iPhone 8 Plus, iPhoneography, Pets, Photography, Rescue Animals, Tippi. ← Interesting Start to the New Year! Aw, they are adorable and that snuggling they are doing is purrfect. 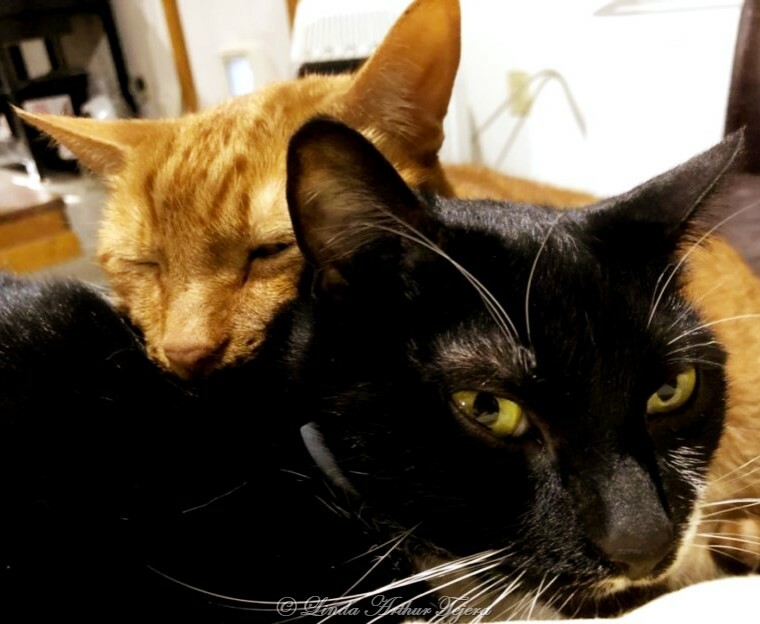 Pretty little kitties … it’s always so sweet to see them cuddling! True statement! Thanks for your visit and comment! Have a happy Feline Friday and a wonderful weekend! Aw, so sorry to hear about Leon. It’s just so hard to let them go. Thank goodness we have the memories. My orange is Freckles. He’s my biggest kitty weighing in at about 25 pounds. We’re trying to lose weight but he’s fighting it all the way! A bit too big for his own good. It’s tough to monitor one of seven! Such cuties. Thank you for the kind words you left on my blog for the loss of Tallulah.